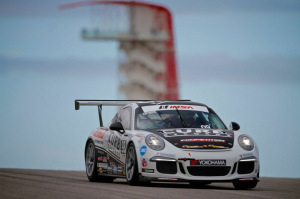 Laguna Beach, California — With a win, a second-place finish and two pole positions at the most recent round in Austin, Texas, Michael Lewis now stands one point shy from first place in the IMSA Porsche GT3 Cup Challenge USA by Yokohama series points standings. 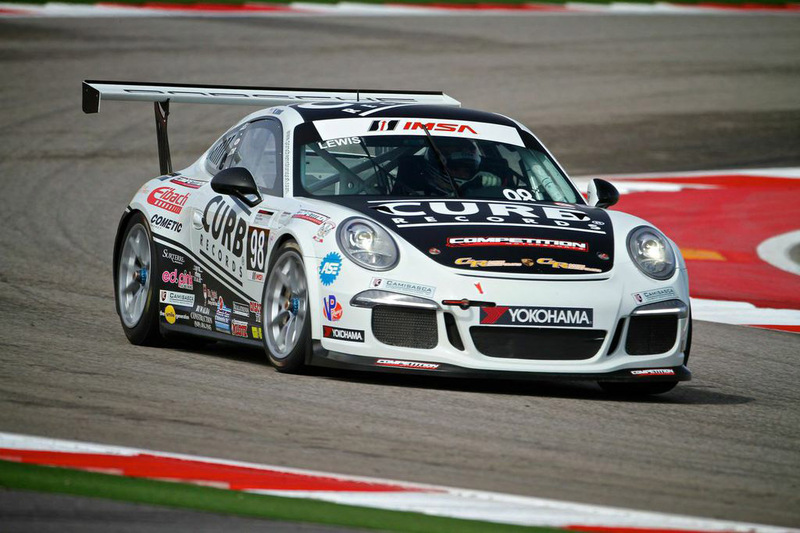 Michael and the Competition Motorsports/Curb-Agajanian team prepared for a strong performance at Circuit of The Americas (COTA) in Austin, Texas, this weekend, and it paid off. 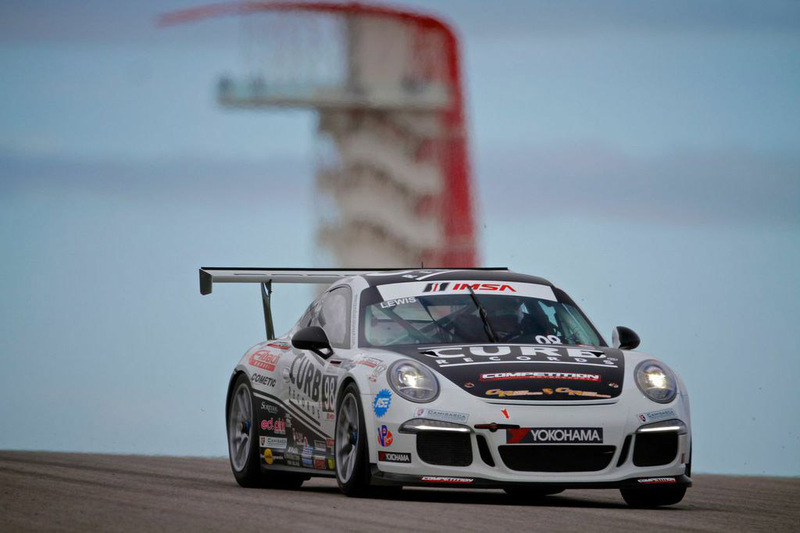 As part of the Lone Star Le Mans event with the TUDOR SportsCar Championship and Continental Tire SportsCar Challenge, the IMSA Porsche GT3 Cup Challenge USA by Yokohama series set out on the track on Thursday morning, September 18, for its first practice session of the event. But rain greeted all the teams when they arrived to the track on Thursday morning. The light rain stopped just before the first practice session on Thursday morning. While the Competition Motorsports team expected the track to dry, high humidity challenged that plan and kept the track wet. But Michael still set the second fastest time during the 30-minute session. Parts of the track did dry in time for the second practice session late Thursday morning, and Michael proceeded to set the fastest overall time in that fairly dry session. 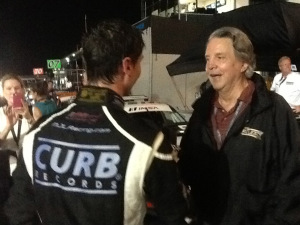 But the rain had not left the Austin area completely, and rain throughout the night placed a solid layer of water over the entire 3.4-mile race track. 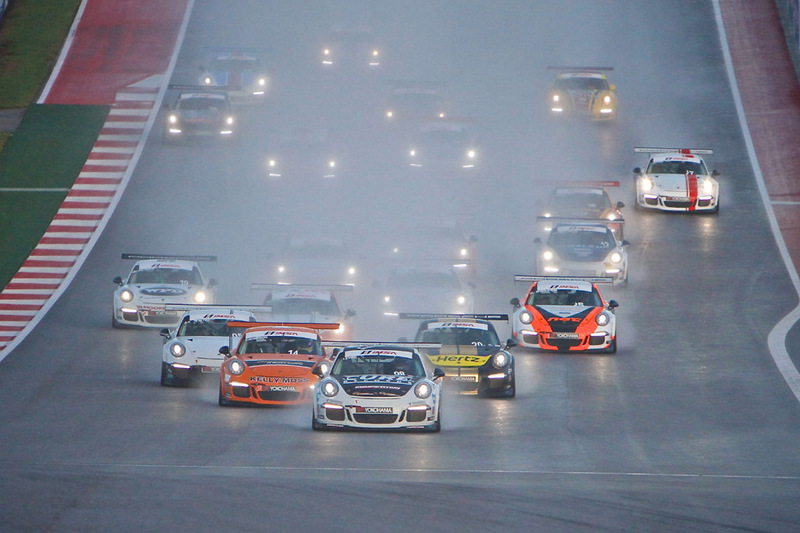 As the green flag waved for Friday morning’s 8 a.m. start of Race 1, Michael led the pack under full wet conditions. As the field approached the first turn, Michael battled with two other drivers and they drove three wide into the turn’s entry. 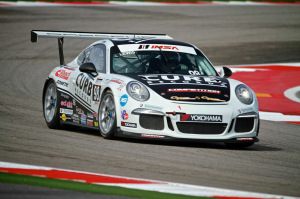 Michael maintained his line and squeezed out of the first corner in first place. From that point on, Michael maintained his lead as he drove his own race, focusing on hitting his marks and leading every single lap of the 45-minute race, in the process setting the race’s fastest lap. Michael finished more than 24 seconds in front of the second-place finisher to gain maximum points and a dominating victory that he converted from pole. Michael’s lead was the largest margin of victory this season for any driver in the series. The second race for the IMSA Porsche GT3 Cup Challenge USA by Yokohama was not scheduled until Friday evening, but that allowed the rain to pass and for the track to dry from the rest of the day’s race activity. Michael’s plan was to capitalize on another pole position and try to convert that into another race win, sweeping the weekend with first-place finishes. 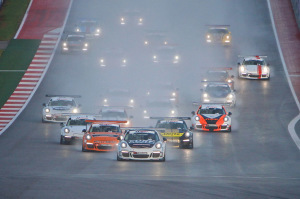 This race served as COTA’s first nighttime race with a start time of 7:25 p.m. right at sunset. This proved challenging to all the drivers who found lighting during the race from portable light fixtures positioned throughout the track. Michael’s strategy was to build his lead quickly to stay in front of the competition. After the race started, he indeed built that large lead through the first two laps. A full-course caution appeared on the second lap for an incident in Turn 11. After a long safety car period, Michael anticipated the restart from his P1 position and took off to open up another healthy lead. After a few laps into the run, Michael’s gap to P2 began to shrink until he was ultimately passed and fell back to second. Though Michael was now in P2, he maintained pace with the leader. In the next few laps, the third place driver also made a pass on Michael and relegated Michael back to third place. 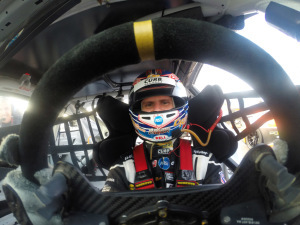 Though he lost two positions since the start of the race, Michael was calm, and collected his thoughts to make an attempt to earn a position or two before the finish. With tire conditions in mind, Michael remained calm and cooled down the No. 98’s tires and sat directly behind an ensuing battle of the first two drivers for the concluding laps of this night race. With five laps to go, the top-three drivers ran nose to tail and caught lapped traffic. As they entered Turn 3, each drove underneath a lapped car, but contact was made between Michael’s No. 98 and the side of the lapped car, which caused Michael’s car to spin into the run-off area in the high-speed Turn 3 complex. Although it appeared that Michael’s race may be over, he managed to straighten the car, click down a couple gears and continue rolling onto the racing surface. With the lead built by the top-three cars, Michael ended up not losing much time and actually stayed in third. With only four laps remaining, Michael and his team were optimistic that they could salvage a third-place, podium finish with some damage to the No. 98 Competition Motorsports/Curb-Agajanian Porsche 911. Astonishingly, Michael began to catch the leaders as the race came closer to its end. With two laps left in the race, the first- and second-place drivers collided, which sent one of them spinning. Michael avoided the car as it spun off the track and drove by to regain second place. As that car drove back onto the track, Michael built enough of a lead to bring his race car across the finish line in 2nd place. 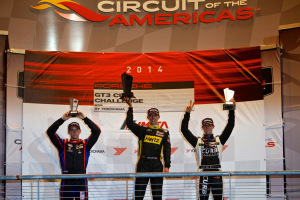 Michael’s fourth win of the season, combined with eight podiums and six pole positions have placed him second in the IMSA Porsche GT3 Cup Challenge USA by Yokohama points championship, only one point behind the leader, as the series heads to its final last two races at Road Atlanta for the Petit Le Mans, October 2 and 3. 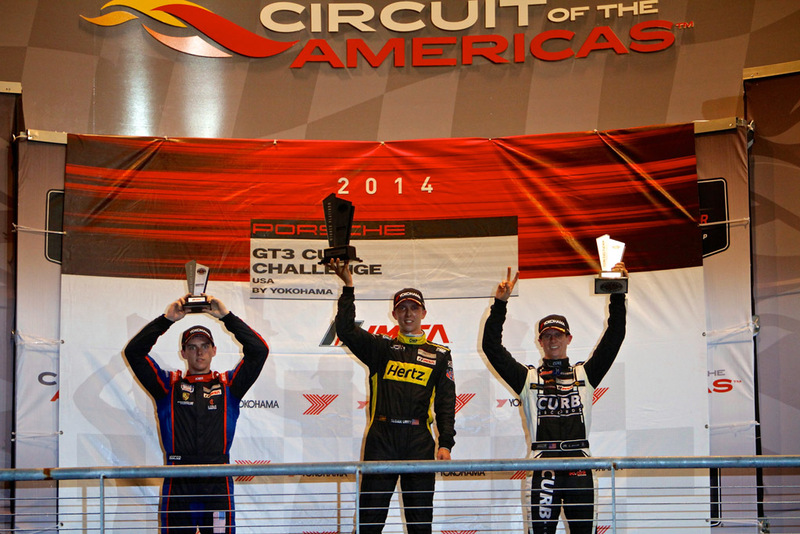 A one-hour show with coverage of both of these races from COTA will be televised on Saturday, October 18, on Sinclair Broadcast Group’s American Sports Network (ASN). It will also be available via YouTube after the televised date. Michael Lewis’ 2014 sponsor lineup includes Curb Records, Eibach, Cometic Gasket, ASE, C&R Racing, McKenna Porsche of Southern California, Ed Pink Racing Engines, Buwalda Construction, Laguna Classic Cars & Art, Camisasca Automotive Manufacturing, Inc., Mönik, Performance Racing Tech-Talk, Realatrends Real Estate Services, Inc., RFMS Racing, Mr. Paint Incorporated, Burger King, Val Lambros, M.D. F.A.C.S., Surterre Properties, Klotz Synthetics, Coast Fabrication, Racing Electronics, GoPro, Bell Helmets, Racing Goes Safer Foundation, JDR Graphics, Hobie Surf Shop Laguna Beach, and SACdesign. This entry was posted in News on September 21, 2014 .